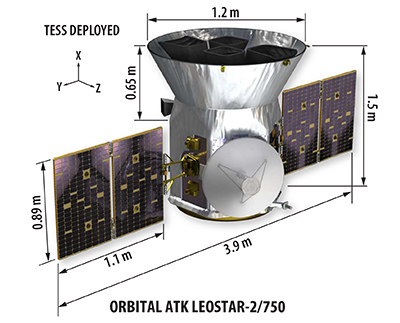 The TESS observatory is based on Orbital ATK’s LEOStar-2 satellite platform suitable for small to medium-class Low Earth Orbit missions and capable of hosting payloads of up to 210 Kilograms. 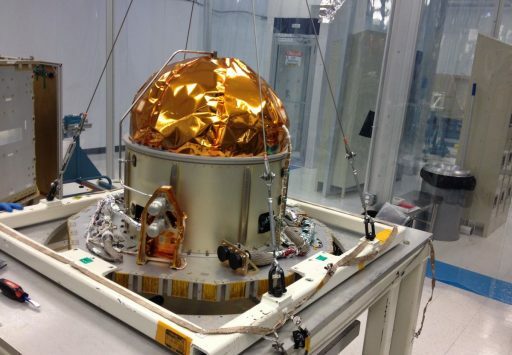 TESS weighs in at 362 Kilograms and measures 3.9 x 1.2 x 1.5 meters in size when fully deployed in orbit, comprising a Platform Section and a Payload Module. 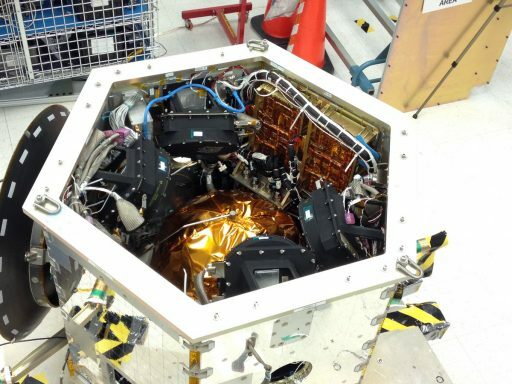 This marks the eighth NASA mission to employ the LEOStar-2 platform that has proven its flexibility since being inaugurated back in 2001. The TESS satellite structure consists of a hexagonal body that acts as the primary load carrying element and provides the mounting structures for various internal and external elements like the two power-generating solar arrays and an external Ka-Band antenna dish used for high-rate communications with Earth. Residing atop the hexagonal structure is the payload interface module. Aluminum alloy struts and composite panels make up the internal and external satellite structure, providing installation locations for all satellite components. The satellite body itself stands 1.5 meters tall and measures 1.2 meters in diameter around the 65cm all payload section. TESS employs two deployable solar arrays, each with two panels, creating an array size of 1.1 by 0.89 meters, capable of producing 415 Watts of electrical power delivered to a set of batteries and the various satellite subsystems via a 28-Volt regulated power bus. The typical power draw of the observatory during regular operations is estimated at 290 Watts, providing ample margin for periods of increased power demand and eclipses. 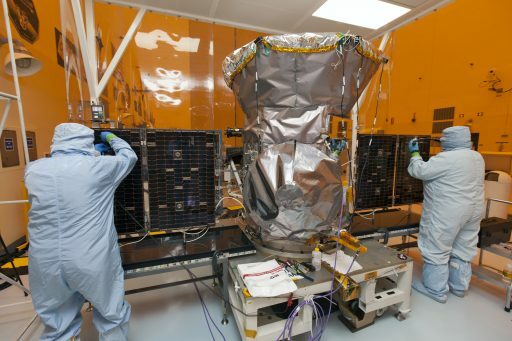 TESS primarily relies on passive thermal control – blankets and thermal paints used on the exterior of the spacecraft provide insulation and excess heat is removed from the electronics using heat pipes connected to radiators. 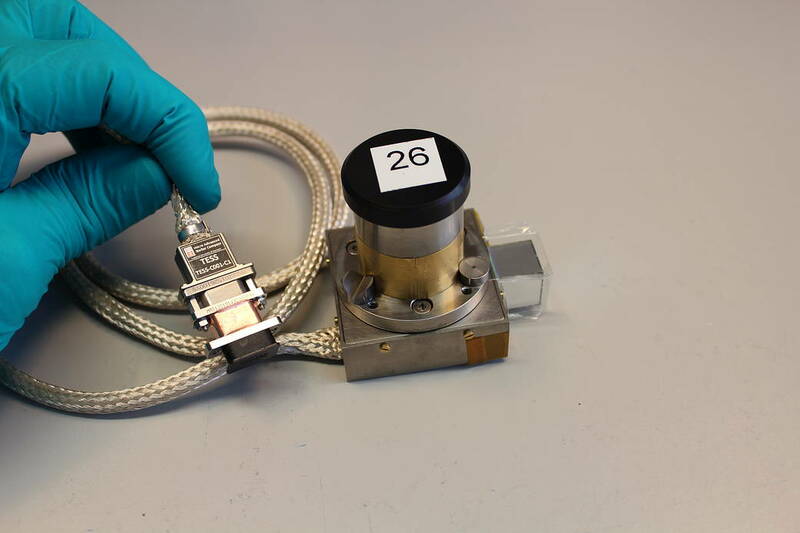 Survival heaters are employed to keep the core electronics operational in case of extended cold soaks which are not expected to occur on the TESS mission since the maximum eclipse duration is limited to five hours. Attitude Determination and Control on the TESS spacecraft employs a three-axis controlled, zero-momentum system employing four reaction wheels for fine actuation based on highly precise quarternions produced from imagery collected by the science cameras. Additionally, TESS employs standard attitude determination sensors active during the initial acquisition phase and other non-operational mission phases. 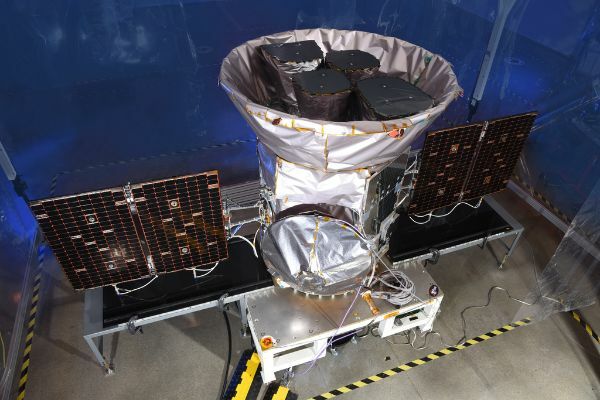 When in science mode, TESS uses its Data Handling Unit to calculate centroids from around 200 photometric guide stars within the instrument field of view at a cadence of two seconds to yield offset quarternions for fine attitude pointing correction. The Data Handling Unit delivers these quarternions to the Master Avionics Unit where the required corrections are transformed to reaction wheel inputs. Selected as the primary attitude determination sensor for the non-science mission phases was the Micro-Advanced Stellar Compass by DTU Space of Denmark, a compact star tracker system that has flown on several past missions with tight attitude control requirements. The µASC Star Tracker Unit comprises two optical heads and a single Data Processing Unit, capturing imagery of the star-filled sky that is analyzed by an onboard algorithm to identify known stars from a large catalog and calculate the craft’s precise three-axis orientation in space. According to DTU, µASC typically operates in a dual-redundant configuration and delivers attitude solutions accurate to 2 arcseconds and supports attitude rates up to 20 degrees per second, generating 8 (nominal) to 22 measurements per second and requiring only 30 milliseconds for initial acquisition from a lost in space scenario. Additionally, TESS hosts an inertial measurement unit comprising four gyroscopes for measurements of body rates during the initial acquisition/reduction of body rates for µASC acquisition and four sun sensors installed around the Sun Shade provide information on the solar vector for proper pointing of the arrays during spacecraft safe mode events. 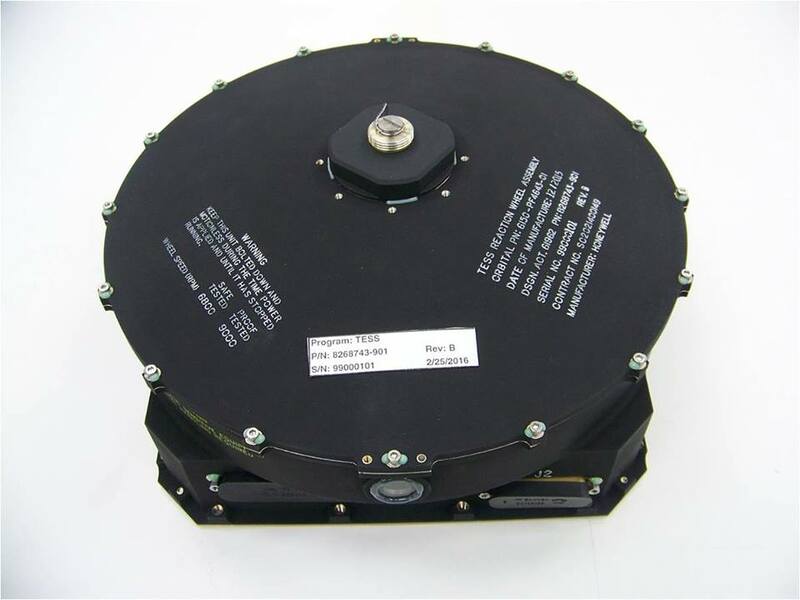 The primary attitude actuator of the TESS spacecraft is an assembly of four reaction wheels, providing precise three-axis attitude control with an accuracy better than 3.2 arcsec with a very high stability of 0.05 arcsec per hour. The four Honeywell HR reaction wheels provide redundancy for the loss of one wheel and employ a robust design that has accumulated over 100 million hours operating in space – eliminating reaction wheel worries the Kepler mission had to deal with due to systemic issues with its particular make of RWA. The TESS spacecraft employs a Hydrazine Monopropellant Propulsion System for orbit and attitude control, feeding a total of five thrusters from a central tank containing hydrazine propellant. All thrusters employ the decomposition of hydrazine over a metallic catalyst bed into gaseous reaction products which can be expelled at high pressure through a nozzle and so create thrust. The system operates in blowdown mode, using only a pre-flight pressurization of the Hydrazine tank and no in-flight pressurization system. TESS carries an initial propellant load of 45 Kilograms and hosts four 5-Newton attitude control thrusters and a single 22-Newton orbital maneuvering thruster, all located on the aft panel of the spacecraft, giving the mission a total delta-v budget of 268 meters per second. Per the primary mission design, 215 m/s of delta-v are budgeted for the two-year mission (including initial orbit acquisition, reaction wheel momentum dumps for solar pressure compensation, launch vehicle injection dispersions and engine performance margin). 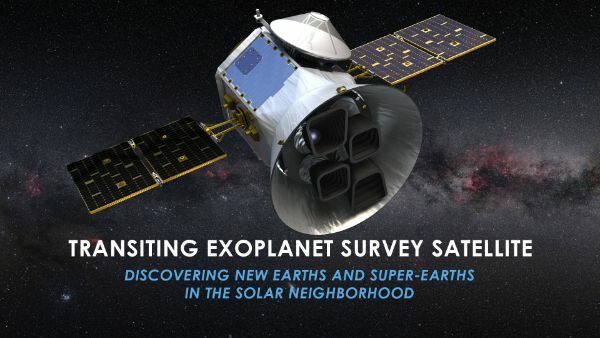 A central element of the TESS mission is the spacecraft’s data handling and communications capability, realized via a central Data Handling Unit (DHU) and a Ka-Band communications terminal capable of transmitting data at 125 Mbit/s – the highest data rate ever supported by NASA’s Deep Space Network. The Data Handling Unit is built around a SEAKR Athena-3 single card computer and comprises several boards to facilitate its processing and interface functions. The central elements of the DHU is a 1066MHz Freescale processor with 1GB of RAM and up to 4 GB of Flash memory. 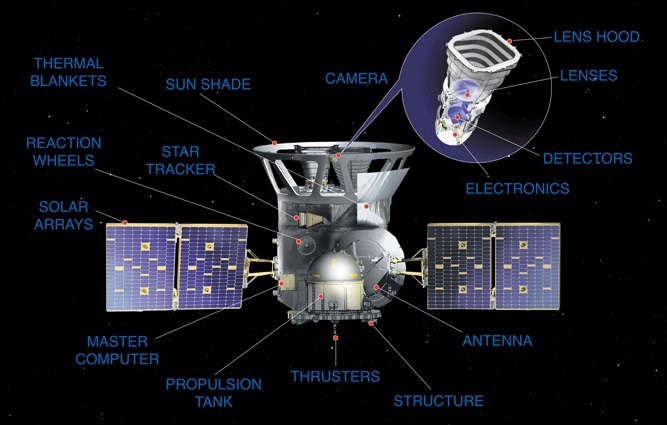 It is tasked with primary image processing tasks and builds the command/data interface with the spacecraft. 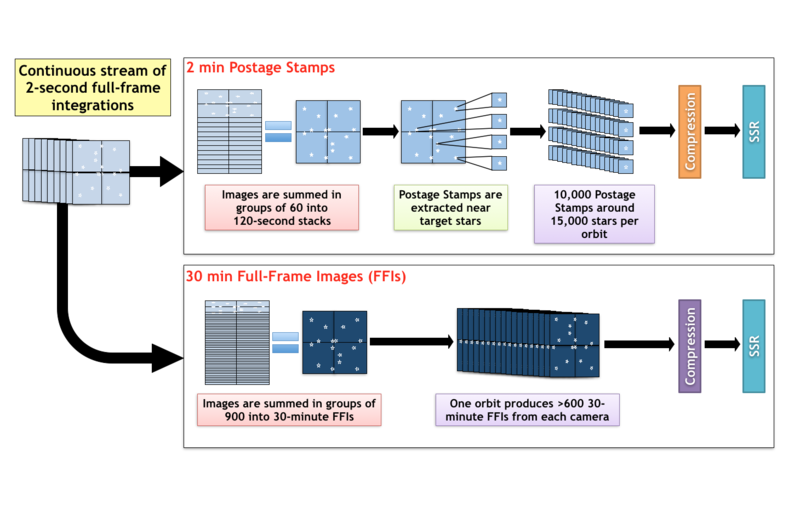 Additional camera processing tasks are handled by a Virtex-5 Field Programmable Gate Array. Three Solid State Buffer cards with a total of 192 GB of Flash build the mass data storage; and an analog Input/Output power switching board controls the instrument power while a dedicated power supply board conditions the DHU power. The typical imaging sequence employed by TESS operates the camera CCD detectors at a 2-second exposure time and these images are delivered to the Image Processing Board where they are summed into consecutive groups of 60 to yield an effective exposure of two minutes. These images are then processed into data products which represent a collection of sub-arrays – windows of typically 10 x 10 pixels centered on the target stars. Extraction of the sub-array values is completed by the Proton 400 k prior to compression and storage in the mass memory. Full frame images are also stacked every 30 minutes and stored in the SSB. Data downlinks are only completed once every 13.7-day orbit when TESS passes perigee to allow for maximum data rates through the Ka-Band link – creating a 16-hour interruption of science operations to facilitate the spacecraft’s slew to the Earth-pointed orientation, a four-hour downlink through the Deep Space Network and the slew back into the operational duty attitude. 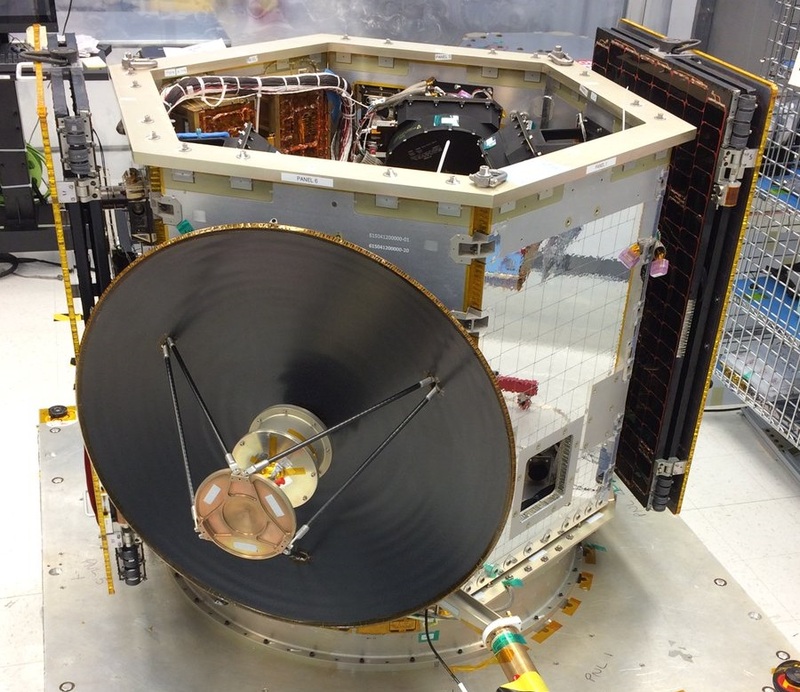 TESS is outfitted with an 0.7-meter parabolic Ka-Band antenna, installed on one of the spacecraft’s side panels. It operates at a transmit power of 2 Watts and achieves data rates up to 125 Mbit/s. A pair of omni-directional S-Band antennas are used for telemetry downlink and telecommand uplink, also enabling communications over greater distances if commanding is needed while TESS is not near perigee.